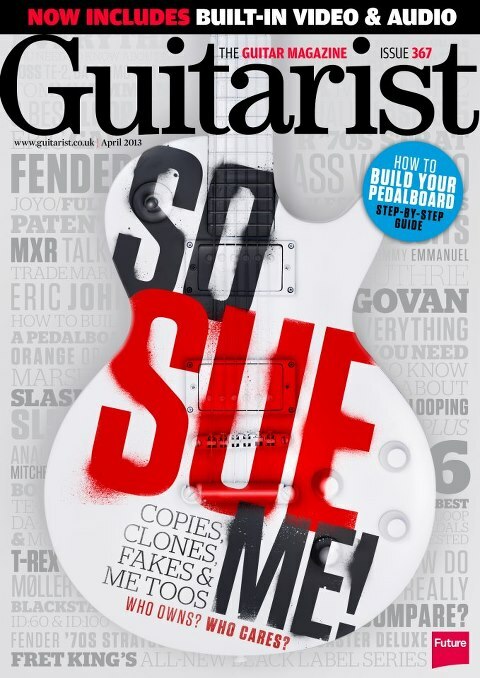 Slash and Marshall engineer Santiago Alvarez give Guitarist the exclusive inside story of the development of the SL5. When did SL5's development begin ? Santiago Alvarez: Yes, the SL5 started when we were doing the AFD100, so that would have been around September or October 2010. It was [former Marshall new product co-ordinator] Luke Green who presented the idea of a small practice combo, and we started doing the initial designs then. Were you both involved from the outset ? Slash: I was with Santiago the whole way. The AFD was one of those things where we sat down and talked about it. I sent him my solo'd tracks from the "Apetite For Destruction" record, things like "Nightrain", "Welcome to The Jungle","Paradise City" and he came up with the first prototype. So, I worked with it, sent it back and forth. Finally, it started to really come together, and once we had that formula, we had to do something else with it. That's where the SL5 came from. Santiago: It was originally called the AFD5, and we produced a prototype that we presented to Slash at the AFD100 launch. It Was only the first prototype, so I brought it back with me and met him here in Hong Kong when he was touring Asia. We had it in the warm-up room and he was very happy with it, over the moon. Slash: We were working on it while I was on the road, so I'd use [AFD100 prototypes] at soundchecks. I'd also send one over to where we rehearse, and we got to the point where I started to swap out my regular live heads, to use it and to really start to absorb what was right with it and what we might wanna change. Santiago: He gave me his address and asked me to send the amplifier to him there, and he was always in contact, saying how happy he was with it. He suggested one small change, to make the high-end a little bit less, so we made the change and completed the amp in 2011. Slash: We'd mostly talk on the phone, because it's way easier to express the nuances of an amp's tone, the gain levels and all that stuff verbally rather than writting it down. So, was the orginal idea with the SL5 to produce a smaller version of the AFD100? Slash: It's a little bit more flexible than that. Even with the AFD, there's another setting where you can switch it to a JCM800, my other favourite Marshall, but with this one you can do the AFD sound. We weren't actually thinking too much about "Appetite For Destruction", but more about the amp. Santiago: We didn't want to just do a low-powered AFD clone; it needed to be something different that appealed to people. The circuit inside is quite close to the AFD - not the same, but close. Tell us about the features. Santiago: The full feature set was drawn up by Luke Green and myself. I told him that if this was going to be a Slash amp, we'd have to put a [celestion] Vintage 30 in there a tiny speaker makes the amplifier sound tiny. Santiago: I suggested we try the EL34 since there was no power soak, and that made it much easier than [using] an EL84. We had problems with those in the Class5 because it would become microphonic: EL84s are tricky. What do you like about the one-watt setting ? Slash: It sounds great on either [setting]. Five watts is loud enough for anybody's home, but the one-watt mode is great because you can play that in your bathroom and no-one is gonna bug you about it. Santiago: That switch is actually a pentode/triode switch. people expect that it's half-power, because at 100 or 50 watts pentode to triode is half, but a single-ended amp like this it's closer to one quarter or one fifth. So, the SL5 goes from around 4.8 watts to 1.2 watts, and it does sound different, smoother and, I would say, fuller, too. The 1x12 is still a bit small for the full five watt so, for me, the amp reacts better when in one-watt mode. Slash likes it a lot, too. There's a dedicated clean channel this time, too. Santiago: The clean channel was because we didn't want to include the [AFD100's] #34 mode. It's actually taken from the green setting on the JVM2 and tweked a bit. Santiago: I hear that's it's expensive. The original plan was to build the amp in England, but you do have to pay much more for the workmanship, which would have taken the amp way out of any market. We didn't cut any corners, either. It has ceramic circuits and rubber knobs with the engraved plastic pointer, and Neutrik jacks, which we don't use in the UK, plus our new logo, which will become our standard logo. Are there any new Slash-related Marshall products in the pipeline ? Slash: I can't divulge what that is. It's cool, though, and is nothing to do with the AFD. The AFD was really a homage to all the different guys out there, fans and whatnot, who've been trying to build that #39 amp that I had for, like, five minutes. It was being put in to recreate that sound until years later. I was like, 'what if Marshall just put out that amp again?' And that's basically what we did. So, it was really in the spirit of those guys, and now i'm moving on to some different ideas. Santiago: You know, Slash is a very shy guy, and he hates having people around him. you know his past, right ? I was surprised when I first worked with him on the AFD; he was sharp, he hears everything and he was really good at giving feedback. It can be difficult to explain changes in EQ, for example, but he's really good at that. He's always spot-on, he never complains and I could work with him every day.